cabinetry finish! Selecting a new finish is a fun process which can transform your old and familiar space into a complete breath of fresh air. You also have the choice of designing something either modern or classic, so you can give a voice to your inner artist. So without further ado, here is our quick guide to choosing a new finish for your closet cabinetry! Wood and laminate cabinetry are a classic look which will never fade from style. From the Victorian to the modern era, wood has remained a mainstay material when it comes to wardrobe storage units. Whether you use wood for drawers, shelves, or stand-up wardrobes, wood is sure to look classic and to hold up well over time. If your goal is to achieve a fully classic look, be sure to use a standard finish like natural maple, clark cherry, or wild cherry. You can browse our full list of available finishes here. If you’re aiming for a more modern aesthetic, you absolutely have to check out these contemporary finishes. These finishes are a safe bet to modernize any closet space and might even be considered modern classics. They work so well because they embody bolder more uncommon colors like black, white, and gray, while simultaneously maintaining the natural grained appearance of real wood. Some of our favorite finishes on this list are white chocolate, dark chocolate, and sandalwood, though they’re all pretty spectacular. If you want an even more striking look, then you should consider a cross-grain laminate finish which will both add a feeling to your closet space which is both chic and exotic. Check out examples of these chic finishes here! 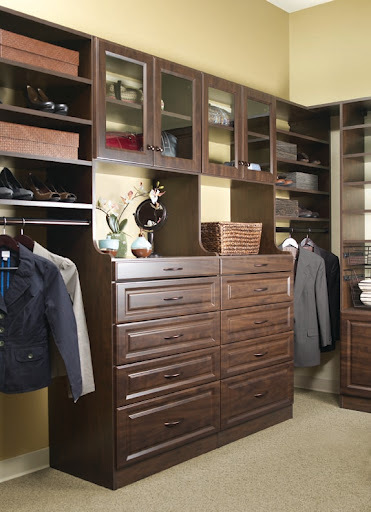 While a new finish on a cabinet or two can be a pleasant closet modification, nothing beats the feeling of reaching into a fully customized closet which you have designed. At More Space Place Dallas, we offer customization services to all customers and we help you get started with a free design consultation. Today is a perfect day to begin a new closet renovating adventure, so contact us today to book a free design consultation and let’s get it started!